From the Half-Blood Prince to Bonny Prince Charlie. What are the most iconic moments in the Harry Potter movies to you? Is it running through platform walls, turning invisible, knowing that it’s LeviOsa, not LevioSA? Or is it perhaps the magical scenery and surroundings that the movies are filmed in? The rail journey to Hogwarts School of Witchcraft and Wizardry is one of the most iconic and memorable moments throughout the Harry Potter movies. Perhaps because it is always an eventful journey, whether it’s nearly crashing a flying car into the train or getting attacked by dementors, it is far from your normal commute to school. Despite all this commotion taking place on the train, the eyes of the viewer are drawn to the countryside that lies beyond the windows as the Hogwarts express travels over the Glenfinnan Viaduct. 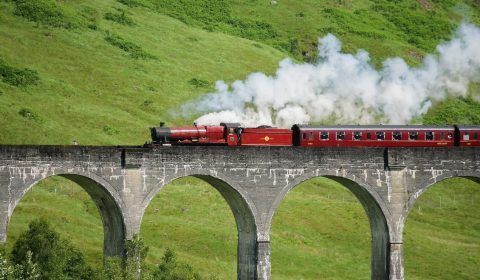 There is a chance for Muggles like you and me to experience this journey by getting on the Jacobite steam train to Loch Nevis, which is just as magical to look at as Hogwarts. Or if you want a really good view of the train you can watch it go over the viaduct from our visitor center at the Glenfinnan Monument (maybe you’ll even spot Hedwig!). The journey to Hogwarts, more commonly known as the “West Highland Railway Line” runs for 42 miles, from Fort William to Mallaig, crossing the Glenfinnan Valley on the Glenfinnan Viaduct. In the Harry Potter movies, Ben Nevis can also be seen and the stunning area surrounding Glen Nevis. The viaduct was built between 1897 and 1901, located at the top of Loch Shiel in the West Highlands of Scotland, the viaduct overlooks the Glenfinnan Monument and the waters of Loch Shiel. Some of the other landscape scenes of the lake in Harry Potter were shot just down the road at Loch Arkaig, Lochaber, but due to the great number of midges, the lakeside scenes involving actors were made at Virginia Water Lake in Surrey – those pesky Scottish midges! 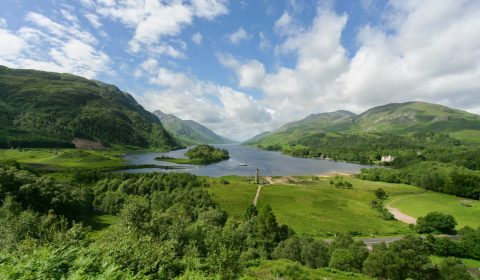 Glenfinnan is not the only area of Scotland to feature in the Harry Potter films. The scenes of Hagrid’s Hut in Harry Potter and the Prisoner of Azkaban and in The Half-Blood Prince, were set in the stunning landscape of Glencoe (also well known for a 007 movie, Skyfall) and one of our “11 Magical Places”. The wildlife around Glenfinnan is another attraction for visitors. Red deer, golden eagles, pipistrelle bats, pine martens and osprey are all popular sightings. But unfortunately no Hippogriffs! From the Glenfinnan viaduct, you can see NTS property and site of one of the NTSUSA’s most recent grants to Scotland, the Glenfinnan Monument, erected in 1815, to commemorate the Jacobites who fought and fell during the 1745 uprising. On August 19, 1745 Prince Charles Edward Stuart, or ‘Bonnie Prince Charlie’ as he is often known, came ashore the banks of Loch Shiel on a small rowing boat. He had come to meet his army of supporters of Highlanders having only brought 50 supporters with him. 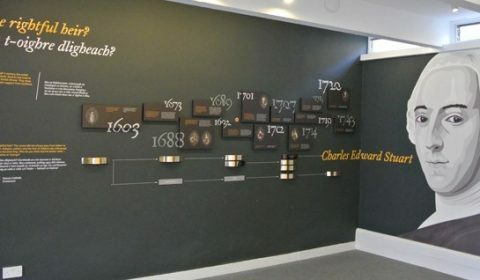 He was also in Scotland to stake the claim of his father – James Francis Edward Stuart, the ‘Old Pretender’ – to the throne of Great Britain and Ireland. After two days, there were 1,500 men assembled for the army. Cameron of Lochiel arrived with about 600 clansmen, MacDonald of Keppoch with about 350, and MacDonald of Morar with about 150. Satisfied that he had enough support to mount his rebellion Bonnie Prince Charlie climbed the hill behind where the Monument’s visitor center now stands and raised his father’s standard. This was the moment that the final Jacobite Rising was born. However, it ended in failure eight months later at the Battle of Culloden on April 16, 1746. The Bonnie Prince never returned to Scotland, he was smuggled aboard a French frigate in September 1746, just a few months after his crushing defeat at Culloden. Today the Prince’s Cairn at Loch nan Uamh in Lochaber marks the spot where he last set foot on Scottish shores. The erection of the Glenfinnan Monument was made possible when Thomas Telford built the road connecting Arisaig and Fort William in 1812 and was completed three years later. It was designed by James Gillespie Graham, a Dunblane-born architect famed for designing part of Edinburgh’s New Town. It was commissioned by Alexander Macdonald of Glenaladale, who came from a family with Jacobite sympathies. Find out more at our visitor center! The Foundation was delighted to be able to grant the final funding needed for conservation repairs to the Glenfinnan Monument. A recent survey found erosion and decay that require an urgent and comprehensive repair program. Of major concern is the monument’s tilt, which occurred due to soil settlement and requires close monitoring. A new roof and windows are required to ensure that rain does not get in the tower, boundary walls need repointing and safety must be improved with the addition of a new handrail and lighting. Work on the Monument started in April 2016 and is now complete. 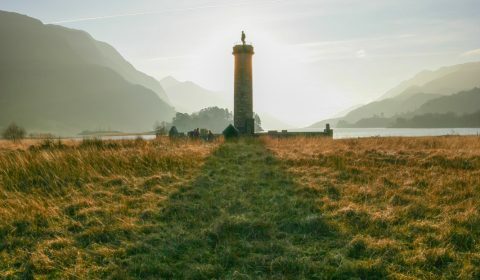 A big thank you to those who helped us reach the goal for the Glenfinnan Monument, but there are still many more projects that need your help!